Dr. Volz was Co-Principal Investigator for a project to determine if there was any connection between heavy metal exposures, particularly associated with coal fired plant energy production, & autism &/or autism exacerbations. This study investigated the environment of Western Pennsylvania & its effect on the neurological development of children with neurodevelopmental disabilities. The first portion of the study consisted of creating a database of domicile, clinical & laboratory information on children followed by the Neurodevelopmental Service at the Children’s Institute. The sites of potential pollution affecting children in Western PA were documented, utilizing public sources of information. The PI reviewed the trends of this data, searching for commonalities of clinical & laboratory presentation in relation to patient domicile. Assist the Children’s Institute through its Principal Investigator (PI) with design of the study & hypothesis to be tested, particularly with aspects concerned with coal fired plant emissions, wastewater & waste coal & flyash. Research the placement locations of flyash piles throughout Southwestern PA, obtain geographic coordinates & depict on Arc View Program layer. Assist PI in determining if proximity to flyash exposure through water or air exposure could affect autism-exacerbations. Attempt to obtain priority pollutant monitoring data from Allegheny County Health Department & PA Department of Environmental Resources. Also attempt to obtain samples of the actual PM10 & 2.5 filters for subsequent analysis by Dr. Kingston’s group at Duquesne University for an agreed upon suite of metals. Assist in the layering of this information on Arc View Maps. Model plume releases from the Bruce Mansfield plant in Shippingsport under “normal” conditions of release & release when oil discharge is present. Do a Department of Environmental Resources (DEP) file review to determine industry-DEP data on content of plume releases during the “mist” release phase. Compile a report on what is generally known about plume releases from this plant including its rated output, burn temperature, any isokinetic stack samples & data on releases in the period from 2006-2007. Assist the PI & Research Coordinator in developing a survey instrument to be given to caretakers of children selected for more detailed environmental exposure & clinical history. Advise the PI about evaluatory methods & investigate all potential variables of the clinical setting that could be compared against found pollution variables for possible correlation. Work with the PI’s assistant & Co-PI Dr. Skip Kingston, Duquesne as required for the successful outcome of the project. 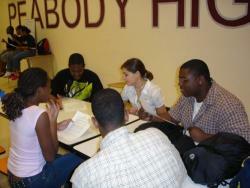 The CAST (College After School Team) is a program that allows university students to participate in an after-school program for high school students at a local urban high school. The CAST provides a framework wherein university students can collaborate with high school students on projects related to school, community, & environmental issues impacting health, well-being, & achievement. The program should appeal to university students interested in a variety of fields, including medicine, social work, public health, environmental studies, urban studies, & education. While engaged in group learning processes & projects, university students also serve as role models & exert positive peer pressure to prepare the high school students they work with for college. More broadly, the CAST aims to help high school & university students alike learn how to take control of their lives, engage in improving their communities & environments, become leaders & agents of change, & move towards positive futures. University students working with the CAST program are expected to form meaningful mentoring relationships with high school students. At the onset of the program, university students receive training in effective mentoring, in working in groups, &, with Earth Force, in a problem-solving process for approaching community & environmental problems. 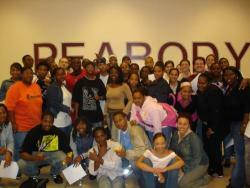 The CAST then meets at Peabody High School on Fridays from 2 to 5 PM during the academic year. Besides the Friday sessions, university students in the program also spend 2 additional hours per week, arranged at their own convenience, working on projects with high school students. By involving urban high school students in community building, the Original Gardeners (OGs) Project benefits the community, high school students, & the university & its students. This collaboration between the University of Pittsburgh’s Center for Healthy Environments & Communities (CHEC) & Healcrest Community Farm is an extension of CHEC’s College After School Team (CAST) program, which runs through the school year at Peabody High. Staff members include CHEC-affiliated public health graduate students Andrea Arrington, Andrea Grana & Eric Hulsey; Graduate School of Public Health staff Tammy Thomas; & Healcrest Community Farm director Maria Graziani. CHEC staff member Dave Wheitner also assists intermittently. The students have already made great progress at Healcrest Farm: weeding & maintenance of the existing garden at the farm, clearing & tilling an area for their own vegetable/herb plot, clearing a large area of invasive Japanese knotweed & establishing a Humanure outdoor composting toilet, & constructing a rainwater collection system! The Original Gardening Team wishes to thank the following for their support: the Frick Environmental Center, Greenlots, Healcrest Community Farm, the Heinz Endowments, Joanie Lapic, Mildred's Daughters Farm, Nine Mile Run Watershed Association, Casey at River Valley School, the Rosedale Block Cluster, Whole Foods, & the caring neighbors in the surrounding communities. Healthy Homes Resources has just been awarded a grant of $ 925,000 to conduct in-home environmental interventions to improve the health of low income asthmatic children. This grant proposal was developed by Evelyn Majoris of Healthy Homes Resources (Co-Principal Investigator), David Skoner, M.D. of Allegheny General Hospital (Co-Principal Investigator) & Conrad (Dan) Volz, DrPH of GSPH/EOH (University of Pittsburgh, Evaluation Principal Investigator). This money will be used to provide services to an additional 100 children over 50 who are being recruited now for a pilot study. Children will be recruited from the north side communities of the City of Pittsburgh. The pilot study, funded by the Heinz Endowments, will recruit 50 children who have environmentally induced asthma as determined by skin tests. These children will undergo baseline pulmonary function testing & other pre-intervention outcome measures will be recorded such as lost school days, rescue inhaler use & emergency room visits. Once baseline indicators are established the children & caretakers will undergo an educational program regarding identifying & removing environmental asthma triggers in the home. Additionally, the home of each child will be evaluated for the presence of triggers such as pet hair, molds, dust mites, cockroach parts & droppings & rodent particles. Each home will be cleaned by a remediation team based on the triggers identified. To determine the effectiveness of the program, air sampling will be performed both before & after the home cleaning intervention to determine the effect of the cleaning. This makes this study unique because it is the first study that will look at actual air levels of allergens & correlate them with asthma symptoms. These children will be followed for the next 18 months to determine the persistence of effect from the intervention, if any & to determine the effectiveness of ongoing education & home visit programs. Lessons learned from evaluating the pilot program will be used to refine the intervention for the next 100 children, funded by HUD. The HUD grant runs from October 1, 2004 thru Oct. 1, 2007. Our goal was to create the foundation for a consolidated information inventory & data needs assessment that will benefit numerous information producers & consumers within the environmental health community & help to direct future energies in this area. We did not not attempt to collect actual datasets, but rather information about the pertinence, availability & major strengths/weaknesses of the data, & descriptions of current endeavors that have already compiled & creatively linked information. We gathered input from government, non-profit, for-profit, advocacy & community organizations. If you'd like to provide input after reading the report, please email Chuck Christen: clc142@pitt.edu or call him: 412-624-9379.